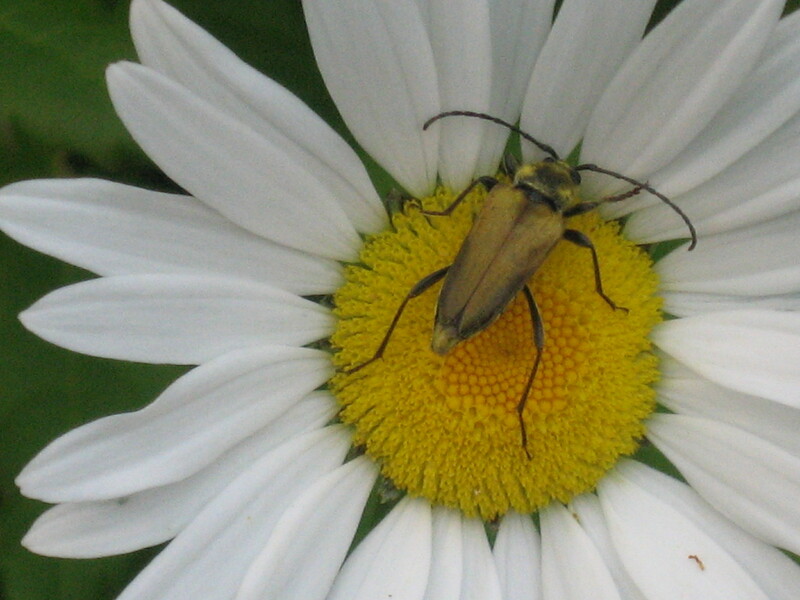 The goldenrod crab spider is the most abundant of all the flower spiders. This is in part due to abilities it has acquired through adaptation. One of these adaptations is the two sets of enlarged front legs. This allows the spider to walk sideways and backward as well as forward. It does not need to turn its back from a predator to escape. 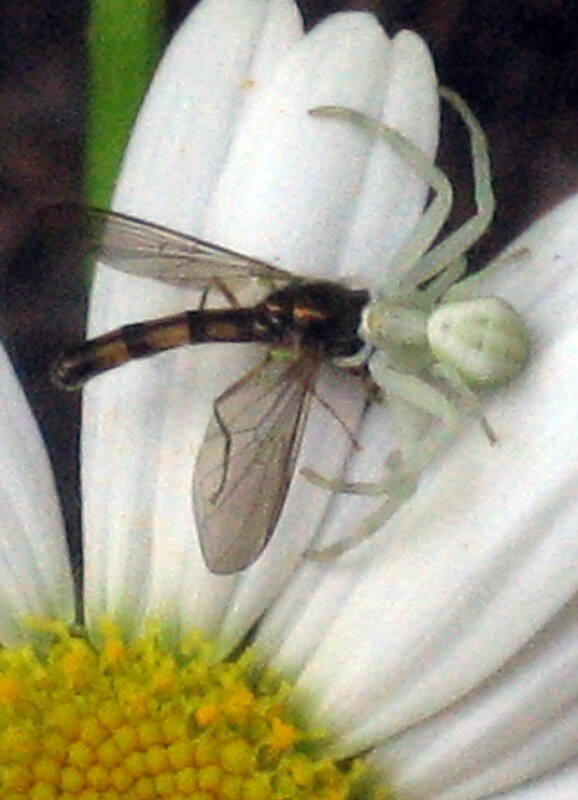 The crab spider can also use these legs to grasp its prey, paralyze it by an injection of venom and liquify and consume its meal without the bother of spinning a web to catch it. In order to actually ensnare its prey, the spider must rely on another specialization. It has the ability to change colors and blend in with the flower it is hunting from. The spider remains still and unseen, waiting to ambush an unlucky insect that choses the wrong flower to pollenate. 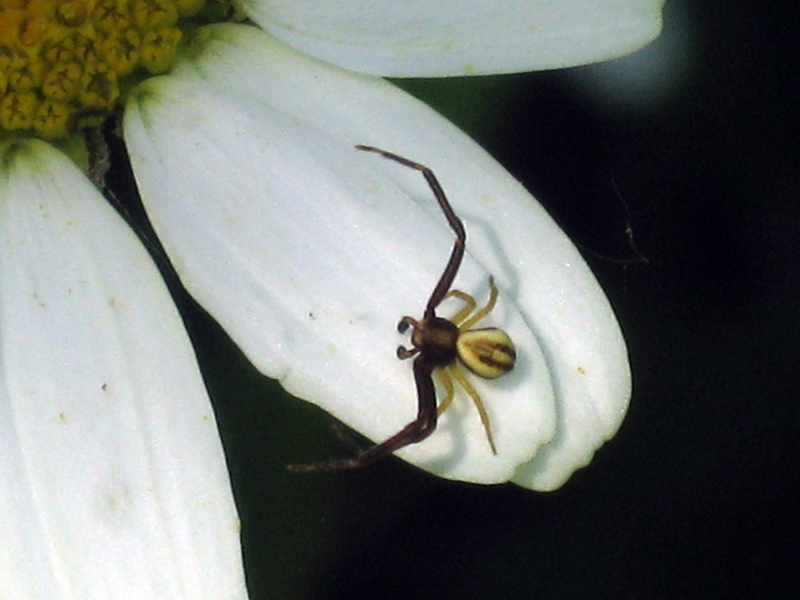 This color change may require several days before taking effect once the spider moves to another variety, so it prefers to hunt from a particular type of flower. The spider’s color-changing talent is not only beneficial as a means of catching prey, it is also helpful to avoid becoming prey to predators such as birds. The golden crab spider is just one example of the many creatures which have adapted to flourish on this earth. 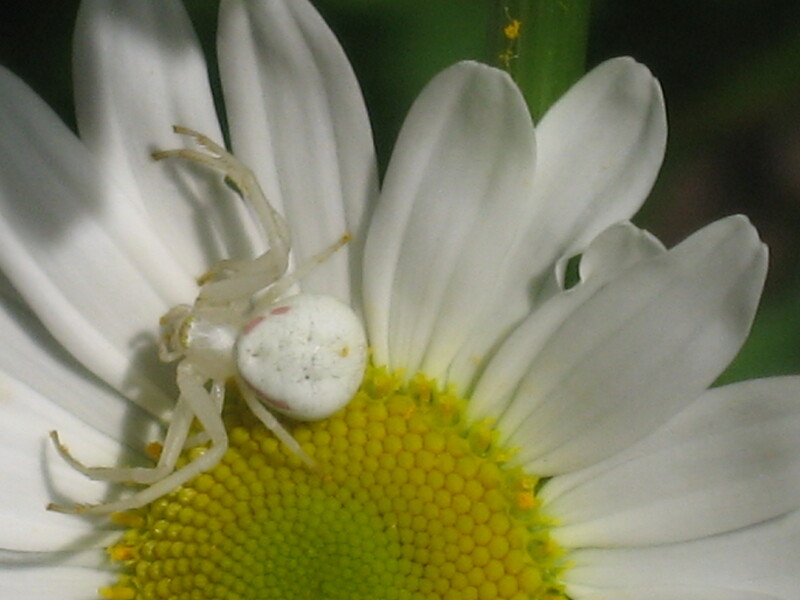 Gallery | This entry was posted in Crawling Things and tagged Adaptation, Camouflage, Crab Spider, Daisy, Flower Spider, Goldenrod, Goldenrod Crab Spider, Misumena, Misumena Vatia, Vatia. Bookmark the permalink. I like “adaptation,” as it speaks to the non-supernatural essence of life. Well done, thank you. Excellent series of photos of them. I see a lot of them here on wildflowers and always enjoy seeing them. We had one in residence in a flower bed a few years ago on some yellow tupils and she stayed over a month. Sure was hard to find we we wanted to see her! She spent the nights inside a flower. Thanks for the reply! I would love to do more pieces like this, but shooting subjects this small pushes the boundaries of my skills and the camera I now own. It would be great to be able to slap a macro lens on and really explore the world of small things. I’m glad you liked this post. 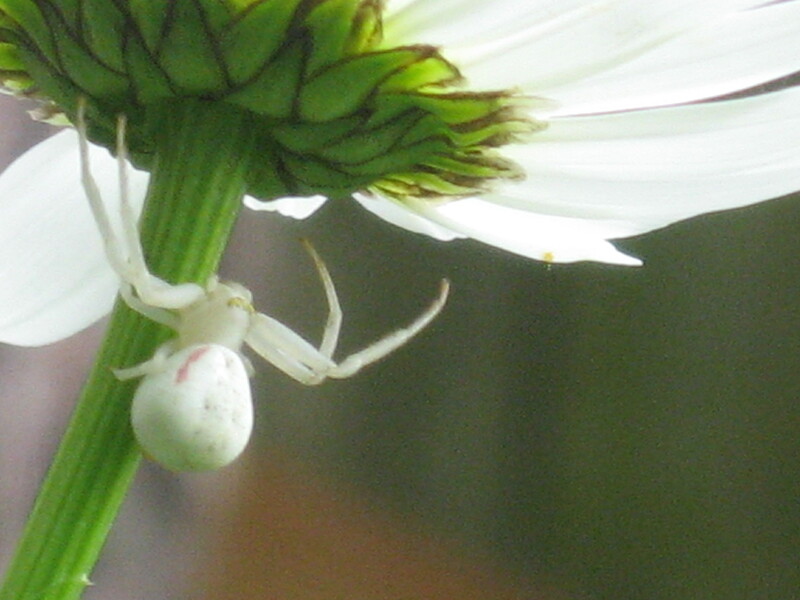 I hope you get a chance to see a crab spider in action. They are really fun to watch. I just realized this is only my 2nd post featuring an animal (both were arthropods). Up to this point I have concentrated on plants and fungi. I guess because they are less likely to spook when you are trying to take their picture. Nice post! 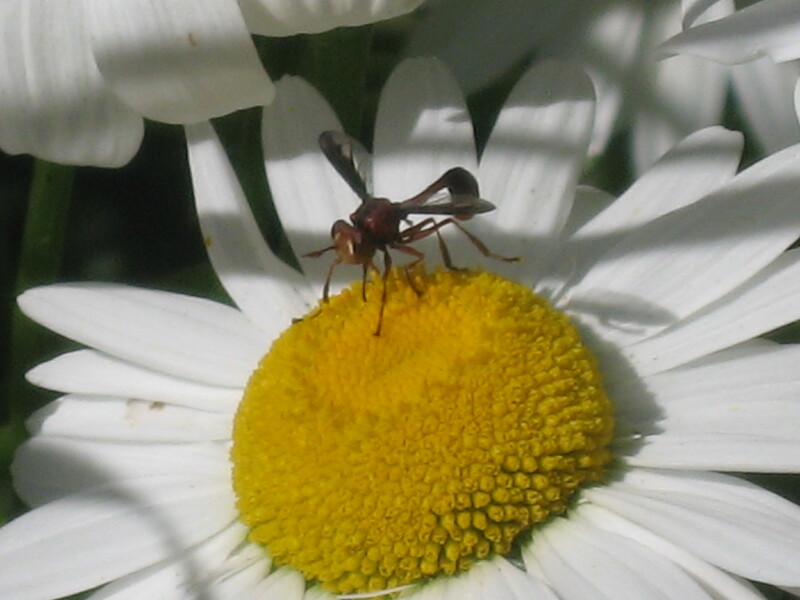 You may be interested to know that your ‘wasp’ photo is actually a Dipteran mimic (fly mimicking a wasp) probably of the genus Monoceromyia. Many thanks for bringing this error to my attention. Fabulous photos, and a fascinating post! Thanks for stopping by my blog, so that I can now discover yours! Thanks so much for visiting my site, and especially for the likes and comments. Its nice to hear from you again! Enter your email address to follow this blog and receive notifications of new btweenblinks posts by email.